Online NEET-PG Confirmed, will be in October/November, Published in DC - AcrossPG Exams! This piece of NEWS published in Aug 28, 2012 of DeccanChronical. Exam at End of the year, (official announcement of exam date pending). NBE will conduct the exam. Autonomous institutes not covered under NEET. 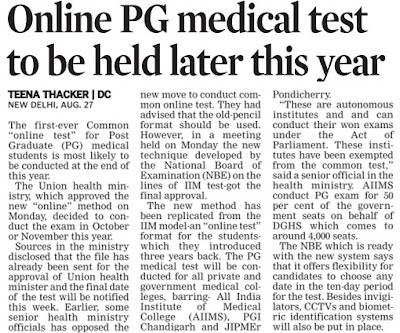 The first-ever Common “online test” for Post Graduate (PG) medical students is most likely to be conducted at the end of this year. The Union health ministry, which approved the new “online” method on Monday, decided to conduct the exam in October or November this year. Sources in the ministry disclosed that the file has already been sent for the approval of Union health minister and the final date of the test will be notified this week. Earlier, some senior health ministry officials has opposed thenew move to conduct common online test. They had advised that the old-pencil format should be used. However, in a meeting held on Monday the new technique developed by the National Board of Examination (NBE) on the lines of IIM test-got the final approval. The new method has been replicated from the IIM model-an “online test” format for the studentswhich they introduced three years back. The PG medical test will be conducted for all private and government medical colleges, barring All India Institute of Medical College (AIIMS), PGI Chandigarh and JIPMErPondicherry. “These are autonomous institutes and and can conduct their own exams under the Act of Parliament. These institutes have been exempted from the common test,” said a senior official in the health ministry. AIIMS conduct PG exam for 50 per cent of the government seats on behalf of DGHS which comes to around 4,000 seats. The NBE which is ready with the new system says that it offers flexibility for candidates to choose any date in the ten-day period for the test. Besides invigilators, CCTVs and biometric identification systems will also be put in place. NOTE: This article is published in newspaper yet the official announcement form Health ministry, DGHS or NBE is not available. So the exam dates are still only pridiction. Lets wait for the official announcement.